April 26 – I’m working on Thai Die and in it a character, finding her apartment ransacked and feeling her life is threatened, flees town. She just gets in her car and goes, but since she hasn’t got a lot of money, she doesn’t go far. So I was looking for a town in Minnesota for Doris to hide in. I picked St. Peter because it has two (!) 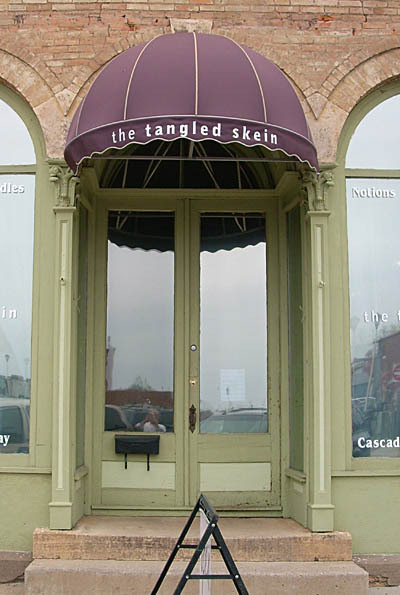 yarn shops (I’ll need a needlework shop to help Betsy to find her) – other towns and small cities in the area I was searching didn’t. St. Peter is about sixty-five miles straight down Highway 169 from here, easy to get to. I had already gone down there this past winter to speak to a class at Gustavus Adolphus College that, for some reason, was learning to knit as part of a history or sociology class. The teacher took me to one of the yarn shops, in an interesting old building across the street from a tavern/restaurant where she bought me lunch. Very nice, the college, the teacher, the food, the shop. St. Peter is an old town — old for Minnesota, anyway, and not far from the Minnesota River, which is a pretty big river, bigger than the Mississippi in places. It has some nice old mansions. I didn’t want Doris to stay in a hotel or motel, because if someone found out she was in St. Peter, they could just check those places and find her. And to my great pleasure, the owner of the yarn shop said there was a bed and breakfast place that didn’t have a sign in front of it! And it’s not advertised, either. Can you imagine having a secret lodging house? I wrote the address on a slip of paper — and I couldn’t find it. I was using a different purse with about two hundred pockets and only thought I went looking in every one of them. And, of course, without a sign, we couldn’t identify the place. Time was wasting away, so we went on to New Ulm. Why? Because Ellen had this cute idea that Doris would want some of her clothes and her laptop, but wouldn’t want them sent to the town she was in, because she doesn’t want anyone to know where she is. So she gives a choice of three towns: St. Cloud, New Ulm, or Stillwater. St. Cloud is north and west of the Cities, New Ulm is south and west (not far from St. Peter, actually), and Stillwater is south and east – she doesn’t want to give away which way she went. She says to leave the suitcase at a place (bus depot, for example) in the town and she’ll pick it up. Betsy agrees to pack a suitcase, but can’t find the laptop. That probably means the person who ransacked her apartment took it. And her computer maven says if someone gets a copy of the e-mail Doris is sending (from a library in St. Peter, but using her own account), he can trace the town it came from. This alarms Betsy, of course, so what she wants to do is leave the suitcase and hide, watching for it, to catch Doris. 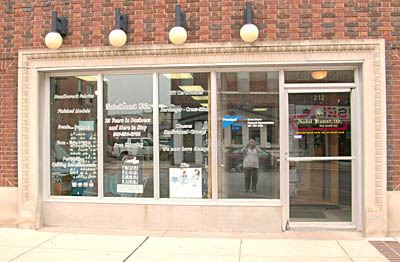 Anyway, Betsy knows of a needlework shop, Nadel Kunst, in New Ulm. Nadel Kunst is a German term meaning Needle Art – New Ulm is a very German town. She knows the owner and has some business to talk over with her, so she tells Doris to come to Nadel Kunst in New Ulm, that they will leave the suitcase there on Monday. Nadel Kunst is a real place, I found it on the Internet. So Ellen and I drove from St. Peter to New Ulm (they’re only about thirty miles apart). The owner is terrific and carries my books, she was all excited to see me. She wants me to do a signing in her place. I wanted a book on New Ulm because it’s such an interesting town, full of things for tourists to do, plus it has a brewery. So the owner sent me to City Hall which has a nice picture book on New Ulm. I was buying it when another woman came in and — you just know I talk about my books to everyone – and we got to talking. She owns a bed and breakfast, too, and knows the man in St. Peter who owns the one that hasn’t got a sign – she told me I really should stop and see it. Then she asked me if I’d like to do a seminar on writing mysteries at her bed and breakfast place. She knows the owner of Nadel Kunst, they are friends, maybe we could combine a needlework lesson with my seminar. Do a stitch-in, maybe! We’ll talk, I promised. Meanwhile, I found the slip of paper, so on our way back up the highway, we found the bed and breakfast in St. Peter – and it is very beautiful. It has one of those carved wooden staircases that, instead of a landing, twists in the air around to the second floor. 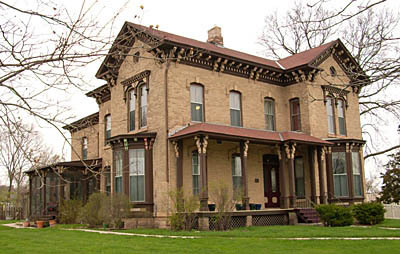 It was built in 1876 in Italianate style, which means small rooms, bay windows and very high ceilings. The bedrooms upstairs are lovely, filled with antiques. Unlike most bed and breakfasts, it’s not packed with totchkes and ruffles, so the beautiful architecture of the interior shows. He says he doesn’t need to put a sign up, word of mouth gives him all the customers he needs. He has a small back bedroom that shares a bath with another small room (probably the servants’ quarters in the old days) that he rents for a very reasonable rate. That’s where Doris is going to stay. It’s funny how, when I’m on the right track, things just fall into place – like that bed and breakfast, like Cindy and Bobbi in New Ulm. I took some photos, I’ll see if I can get some of them off the camera and onto this site. May 16 – I got up early this morning, as I do on Wednesdays and went off to water aerobics. On coming home, I realized I hadn’t written up my blog entry last night, as I usually do. And I didn’t have time this morning, because I had to leave almost immediately after breakfast (a hasty bowl of cereal with a banana sliced in it) for St. Peter, something over an hour down the road. I LOVE research! This is for Thai Die, in which Doris Valentine, in fear of her life, runs away from Excelsior with nothing more than her purse. She realizes she cannot use her credit cards, because they can be traced. So she must use what cash is in her purse, which isn’t a lot. So she can’t go far. Plus, she can’t stay at a hotel or motel, for two reasons. Most won’t take cash anymore, they want a credit card. Second, even if she could use cash, all anyone has to do is call the hotel or motel and ask if there is a Doris Valentine registered there. I went to St. Peter a couple of weeks ago, looking for a boarding house, and instead found a “secret” bed and breakfast called The March Hare Inn and Gallery. The owner isn’t quite finished with restoration (it’s a mansion built in 1876), but will rent rooms if you can find the place. It doesn’t even have a sign in the yard. But I needed to see it again and talk to the innkeeper, whose name is Heidi, to make sure she understood someone is going to die in The March Hare. She did – in fact, she wants me to hold the publication party for the book (Thai Die, coming out in the latter part of 2008) at the old house. Which I think is a great idea! I also talked with a law enforcement man named Ray Thrower, who now is in charge of the security force at Gustavus Adolphus College, who gave me some extremely relevant information about how this crime would be investigated, and how Doris Valentine, who will run away again, might be found. And Prof. Elizabeth Baer, who arranged my appointment with Thrower, told me a great, great place Doris might end up in her flight. Did you know Minnesota is full of eccentric people? There’s a very small town way south of here where a woman bought a 1920s gas station and turned it into an excellent restaurant. She also raises angora rabbits and combs out their fur, spins it into yarn which she dyes and knits into mittens and scarves. Angora rabbit fur is the most delightfully soft yarn you can imagine. The town is called Amboy, and I never heard of it until today. Well, Doris loves to knit, so the two get to talking and Doris ends up hiding out in Amboy. I also spoke with the second-in-command at the Sheriff’s Department – St. Peter is the county seat down there. He told me that BCA (Bureau of Criminal Apprehension, the Minnesota state crime lab people) would be called, and his department would turn out, and the local police department would be first responders plus sending an investigator, and the county coroner would also come over. It’s going to be rather crowded at the foot of those steep stairs! I’m going to use real names of real people in all of this – except for the police. The chief was a nice, tall, soft-spoken but wary man, who asked me not to use his or a detective’s real name. So I won’t. I just got home and haven’t had my supper yet, so I’m going down and eat a hot dog and some potato. May 21, 2007 – Someone told me Amboy is where a woman named Lisa lives. Lisa not only runs a cute little restaurant she made out of an old gas station, she spins wool and angora fibers, dyes them, and knits them into hats, mittens, etc. So that’s where Doris is going to end up after she runs from St. Peter. Amboy is a long drive from the Twin Cities, as I found out on Monday. The weather was breezy but sunny and not too hot. It’s a very pretty drive down 169, which pretty much runs alongside the Minnesota River. The river, I thought to myself, used to be much bigger than it is now, because it has high hills on either side that are some distance from the river itself. Then, by chance, I paused at a rest stop and read a sign that said the Minnesota River occupies the bed of what was once an enormous river made from the melt-off of mile-thick glaciers that covered the state. A glacier a mile thick! I caught myself measuring off a mile on the highway and trying to imagine an ice-pack that thick. What an astonishing sight it must have been! Amboy is a very small town of about five hundred. The business district is one block long. It has four churches, no grocery store at present, and an antique shop packed full of antiques clothes (Victorian underwear!) and hundreds of hats. 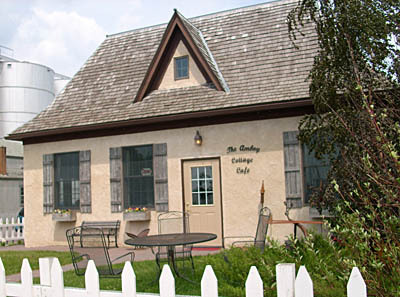 The restaurant I was looking for is in a darling little building set back from the main street in a little lawn with iron (really!) and real flowers. And the food is fabulous! I was a little surprised that there was such wonderful food – and not the basic stuff like mashed potatoes and pot roast you often find in small towns, but basil-flavored tomato soup with mushrooms and corn, and pita bread stuffed with cooked onions, herbed vegetables and grilled chicken. And the best pies in the state. Lisa is a tall, slender, beautiful woman who must never sleep, because she runs the restaurant and a craft shop for her wool and angora items, plus she is buying the nineteenth-century building her shop is in and renovating it, hammering off years of paint and plaster to expose the brick walls, and putting up a tin ceiling by herelf. Her mother, Maria, is an artist and spinster (meaning one who spins! ), too. She’s the one currently raising the angora rabbits. She brought one from her home in Blue Earth to show me. I have never in my life seen a rabbit that big. He was in a smallish wire cage, and at first glance I thought it was two very big white rabbits. He had huge red eyes and the usual winking nose. He didn’t move when I reached into the open top of the cage to stroke him. He was, of course, very fluffy, and I thought it must be all hair, but when I touched him my fingers didn’t sink to my knuckles like I thought they would. This was a very solid rabbit! Lisa sat down at her spinning wheel, spread a towel on her lap, and hauled the rabbit up onto her lap by the scruff of his neck. She showed me how the fur is pulled out rather than combed out – the rabbit did not so much as blink as she pulled out fingerfulls of white fur. She invited me to try it, and, while it doesn’t just fall out, it doesn’t take much of a tug to get a sample of it. Then she started her spinning wheel turning using a foot pedal, the kind that goes up and down, and began feeding the fur into the yarn already coming out of the mechanism. Soon she had a rhythm going, pulling out fur with one hand and twisting it into the yarn with the aid of the other. It was fascinating to watch how smooth and even the yarn was as it came out of her hands. We talked while she worked, and the rabbit – whose name is, I think, Fernando – sat perfectly still. Lisa said the rabbit actually likes being plucked because his fur is so thick and hot. In my opinion (which is worth exactly nothing) Fernando is too stupid to know if he does or does not like something unless it involves drawing blood or eating clover. Since this involved neither, he was content to sit still. He did look as if he were thinking long thoughts – or merely listening to the cricket sounds in his otherwise empty mind. Certainly he has a very small and narrow head, so there’s not room in there for much of a brain. Wool fibers have microscopic “hooks” that make it hold together when twisted. Angora doesn’t have that, so adding wool fibers makes it stronger. But pure angora yarn is incredibly soft, and it isn’t smooth like wool but has a long, thin nap, as if it were enveloped in a cloud. Lisa told me that the younger the animal (goat, rabbit or sheep), the softer the fibers, but I can’t imagine anything softer than the angora yarn she was spinning. Lisa will spin a length of yarn, then take another single-ply yarn and twist it onto the first, going in the opposite direction to make a two-ply yarn that hangs straight and won’t twist back on itself. Most yarns she spins have at least two plies. She had a couple of felted wool hats in shades of pale cream and brown for sale (to make a felted hat or purse, you knit it in a very large size, then wash it in hot water to make it thicken and shrink). I looked at them, but bought a pure angora beret that is a natural color somewhere between gray and blue and so soft I will have to restrain myself from rubbing it between my fingers instead of wearing it. 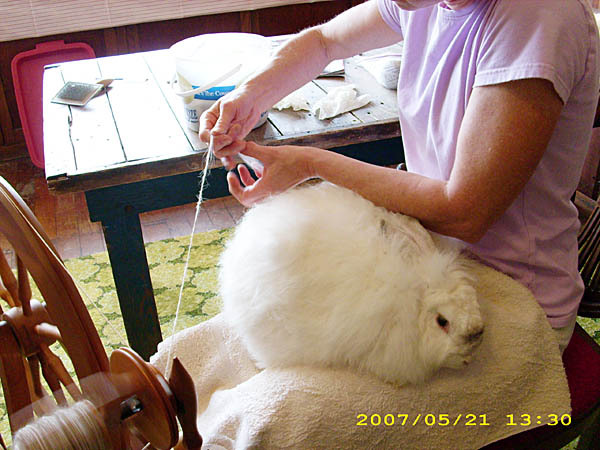 Oddly, rabbit angora will not shrink so it cannot be felted – if it is blended with wool and the wool is felted, the angora will make something like picots (tiny loops) all over the wool. Lisa’s mother has worked with rabbits all her life. And she is an artist in not only fibers. Lisa gave me a card that has a pen and ink drawing on the outside of an angora rabbit, done with a minimum of lines, very beautiful. Her mother drew it and drew a goat and other animals for other cards. But I love the rabbit. Later, Lisa took me into the back yard of her shop and dug up a sample of madder, a plant from which a red dye can be made. She showed me a machine which cards wool, a dangerous-looking thing with lots of rollers covered with sharp wire brushes. And a felting machine which was made of two very large flat pieces that squashed and rubbed wetted combed wool between its panels until it became a solid mass. And she showed me some of her dyed yarns. One, a beautiful shade of green, she’d made using copper wire – and suddenly I realized that it is the exact color of the oxidized copper roof of St. Mary’s Cathedral in Minneapolis. She said Kool Aid is a great dye – she uses vinegar to set the colors. But a lot of her wool and all of her angora is left its natural colors. She had a couple of felted hats (knit then washed in hot water) in shades of pale cream and brown. I bought an angora beret that is a color somewhere between gray and blue and so soft I will have to restrain myself from rubbing it between my fingers instead of wearing it. I think Doris will enjoy a visit to Amboy. The problem is going to be convincing her to leave.